When I started as a magic dealer Tony Stevens asked me to get this trick for him and I was a little dubious but it has proved to be one of my most popular tricks ever. Its crammed with magical moments all through the trick. 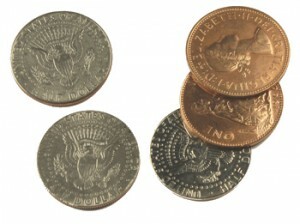 You show a half dollar and a penny both sides and then place the half dollar in your pocket. To everyone’s amazement it immediately jumps back into your hand. Thats why it’s called Hopping Half. You now place the penny in your pocket and then to everyone’s increased amazement it immediately jumps back into your hand. You give your spectator the half dollar to hold and then ask him to drop it in your pocket. When he looks back at your open hand the half dollar is already sitting there with the penny. You finally take just the penny and drop it in your pocket. When you ask him what is in your hand and he says a penny and a half dollar you open your hand and to his utter bewilderment show both coins have gone. Both hands are completely empty. It’s a self working coin trick and you finish clean. It includes a half dollar and an expanded shell, an expanded penny shell and two more clever fakes. As used by Jeff Hobson on the magic comedy strip. You can reset the trick in your pocket as you place the coins in your pocket leaving you ready for an instant repeat at the next table. Without doubt the most commercial piece of coin magic in existence. Many pros have told me they earn a living with not much more than this one coin trick.